Join your fellow Dubuque County Democrats in watching the Democratic National Convention on the night that our nominee for president accepts! 2pm Patty Judge (candidate for US Senate) and Monica Vernon (candidate for US House of Representatives in Iowa’s 1st District) will be here to speak! Located on the lower level of Inn Plaza, 3430 Dodge St., Suite 2 – enter through the doors by the H.R. Block. Handicap entrance located at the back of the building. Visit our HQ Location page for detailed directions and pictures. Questions can be directed towards IDP Organizers Morgan Atwood (479.685.9441, matwood@iavictory2016.org) and KC Stralka (773.440.4649, kstralka@iavictory2016.org). Join us for an afternoon of camaraderie! 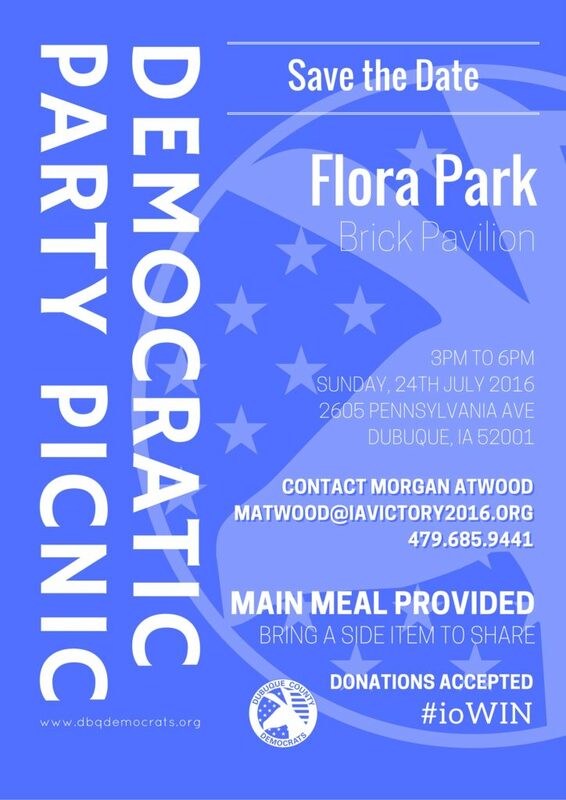 The Dubuque County Democrats will be providing a main dish and all are asked to bring a side item and drinks to share. Donations will be accepted. Menu specifics to come. Please invite your friends. All progressive thinkers are invited. Now is the time to build a community of allies. Questions can be directed to Morgan Atwood, Field Organizer for the Iowa Democratic Party: 479.685.9441/matwood@iavictory2016.org.